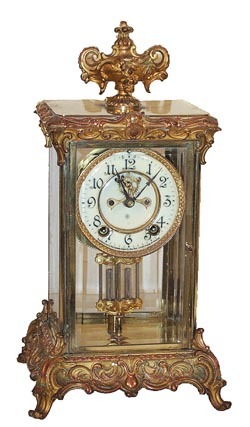 Ansonia Clock Co. crystal regulator, "Crown", ca 1914. 15-1/2 inch gilded brass case and attached, rich gold ornaments, on the top and base. Gilt has been polished too much on the high spots of the ornaments around the top and base. There is green tarnish showing thru, and thankfully their brush or cloth didnt get into the grooves where a great deal of the gilt and some green tarnish remains, which I much prefer over the copper showing.4 perfect beveled glasses, 2 piece porcelain dial with open escapement, allnear perfect. 8 day movement with rack and snail count, striking on a standinggong half hours and hours, runs nice and strong. Everything signed properlyby Ansonia. Would make a beautiful clock with a little judicious cleaning.Ly-Ansonia No. 357.